What kind of packaging does loose leaf tea come in? You may have thought of a metal tin, or glass jar. Perhaps you thought of a bag with a folded top like coffee often comes in. These are all common packaging for loose leaf tea. In many parts of China the default package is none of these, but rather a small heat sealed foil bag with a standard quantity of tea inside. These bags, although designed for gong fu cha tea brewing are better than a large container for most uses. Before I dive into the details of small packages of loose leaf tea I want to list some of the benefits and drawbacks of this packaging style. Small and standard size makes travel easy. Easy to prepare a gift from your collection. If you want a different quantity you will have to open more than one bag, or save some for later. Individual packages don't have much detail on the specific tea. Increases packed weight about 20%. How much tea is in each bag? 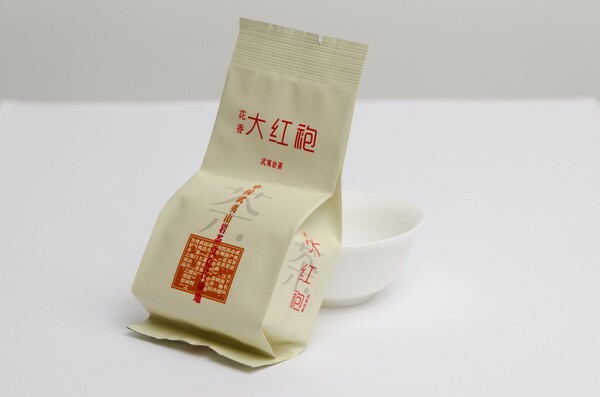 Wuyi oolong teas normally have 8g in each bag while Wuyi black teas have 5g in each bag. Since the different amounts of tea take up different amounts of space the bags come in two sizes. The large bags are a bit more than two inches wide, four inches tall, and one inch thick. The tea occupies about half the available volume making the tea bags stack together nicely for packaging. Each time you brew a particular tea you will be starting with the same amount in your teapot or gaiwan. Since there are three main variables to tea brewing: time, temperature, and quantity you are removing one and simplifying the process of exploring a particular tea. At Old Ways Tea, our rule of thumb is to use a full bag when brewing with a teapot or gaiwan and to use a half bag of black tea or a third of a bag of oolong tea when brewing for one person in a cup. Although the bags do have a spot to tear them open it is much easier to use scissors to cut off the top. If you are only going to use part of the bag, simply fold it over and the tea will stay inside. We usually finish these half bags in the next couple days. If you are going to leave it for a while before drinking you can use a piece of tape across the top of the bag to seal it again and keep the tea fresh. Overall the benefits of Chinese tea bags outweigh the disadvantages. At Old Ways Tea we provide tea in pre-weighed packages. At this time we do not offer bulk packaging, but if there is sufficient demand it may be an option in the future. Enjoy Chinese tea with your friends and family. To receive updates and information on special offers subscribe to our mailing list. Posted on 12 Dec 2016 by Mengjiao and Phil . Posted in Old Ways Tea. Tagged Tea Packaging.